I was up a little after 6a from my secluded campsite off Hume Lake Rd. 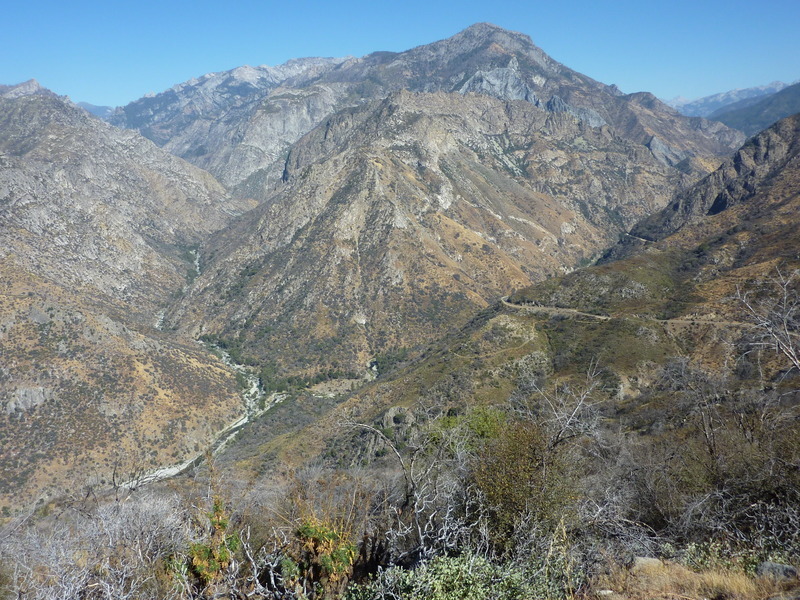 I packed up the sleeping gear, switched the Jeep to daytime mode, and started down SR180 into Kings Canyon. I had intended an ambitious outing to Buck Peak, on the north side of the canyon above Roads End. It would be almost entirely cross-country, gaining 3,200ft in about 1.6mi. Steep and loaded with rough brush, it was the sort of outing I save for when I'm soloing - no need to lose friends over stuff like this. As I was driving down, I saw the sign for the Yucca Point Trail and investigated on my GPSr. It descends to the confluence of the Middle and South Forks of the Kings River, right where the SW Ridgeline rising to Peak 6,580ft begins. This unnamed peak west of Wren Peak, is the westernmost summit of the Monarch Divide, and after finally reaching Wren Peak a year earlier, this one had been in the back of my mind. So on a complete whim, I parked at the Yucca Point TH and decided to do this one instead. It was, in fact, one of the more stupid whims I've had. The problem was that the problems weren't singular, but multi-faceted, a collection of mostly predicable problems that should have kept me from attempting it. Apparently I was too well rested after an easy day and thought could tame Kings Canyon. A look at a topo map would have shown that my starting point was a poor choice, possibly the hardest way to reach it. I thought the trail would be a big advantage on the way out, saving me a steep cross-country ascent at the end of the day when I'd be the most tired. This part was true. The SW Ridge, however, is long and rough. Very long, in fact, almost three air miles. It's hard enough to do such a ridge at higher altitudes over rock, talus and sand, but in this zone between 2,300ft and 6,580ft, it was a brush-fest. It didn't help that a fire sweeping over the ridgeline a few years back had killed off most of the trees and left the brush to grow back with a vengeance. Secondly, it was predicted to be in the 90s in Kings Canyon, and even at 5,000ft (my highest elevation reached), it's brutishly hot. I carried two quarts of Gatorade which I figured would suffice if I could reach the summit in four hours. I was still 1.5mi away after four hours - much tougher going than I expected. It was also Fall, which meant all the grasses and plants would be brown, brittle, and loaded with seeds and thistles - so much fun, those. This last probably can't be helped since the river is practically impassable in the other three seasons. There would also be poison oak below 5,000ft (thankfully not that much) and thanks to the fire, tons of poodle dog bush which was more or less unavoidable. Ignoring all of the above, it wasn't until I had crossed the Kings River and started up the other side that the nature of the brush became apparent. Kings Canyon at this elevation is V-shaped, not because a glacier didn't carve out the canyon back in the day, but because the slopes and rock tend to be loose, unlike say, Yosemite. So after the glaciers retreated, the river continued carving the standard V-shape with tons of material sloughing off the sides of the canyon. This made for challenging scrambling, not entirely unenjoyable, to be sure, but the sort of stuff only a bushwhacking fan could appreciate. Halfway up I found the rusting remains of a juice can, a reminder that even the worst of routes in the Sierra are unlikely to be a first ascent. After about three hours of effort I started to rethink this outing and began actively looking for escape options. It turns out there are a number of more direct routes one could take from the highway to the Monarch Divide, that, despite not having a trail down to the river, would still be easier because much of the ridge can be bypassed. And so it was shortly after the 4hr mark that I decided to abandon the outing. The primary reason - I was beginning to note the signs of dehydration that had led to severe cramping on my last outing in Ventana. My 2 quarts would simply not suffice to get me to the summit and back down to the river (where I'd have an endless supply of water to re-hydrate). Though the descent was steep, most of it went fairly well without serious brush to contend with. There were however, several constriction points where I ran into cliffs. The worst of these involved a very dicey finger traverse over a sloping granite slab. My boots did well enough when there were features to grip on, but a 10-foot section had me on high adrenaline until I had gotten through it. I began to notice signs of cramping in the last several hundred feet of the descent to the river. By the time I reached the river, I was light-headed and starting to cramp. I should have stopped on the north side to rehydrate and recover, but in my addled state, it seemed important for me to first cross the river before taking a break. I had managed earlier in the morning to cross with several large leaps across boulders in the river, but try as I might, I could not find adequate boulders to cross on and I could hardly have jumped with my cramping legs. I eventually decided to ford the river with the assistance of a stick, stripping down to my tshirt, packing the rest of my clothes in my fanny pack and slinging the boots around my neck by their shoelaces. It was another stupid move, but it worked, I only got partially soaked when I fell halfway in a few times, but luckily the fanny pack (with non-waterproof electronics) stayed mostly dry. I spent an hour at the river drinking more than two quarts of it. My legs got far worse before they got better, cramping quite badly (maybe the cool water didn't help? ), first one leg, then the other, then both, as I found it difficult to find positions to give them relief. After about 45min the extra water began to take effect and I was able to get dressed (it was impossible to put on socks or pants while cramping and continued). Between bouts of cramping pain, I had picked out a route back up to the highway that worked nicely, a talus/boulder field that reached nearly from the river all the way up to the highway. No cliffs, no loose dirt and brush to contend with, just loose rock - which seemed highly preferrable at this point. When I got to the highway I was more than two miles from the trailhead and the Jeep. I stuck out my thumb as I started walking the road and was thrilled that the very first car stopped to give me a lift. This young Israeli couple would become my very best friends for at least the five minutes it took to drop me off at the Jeep.